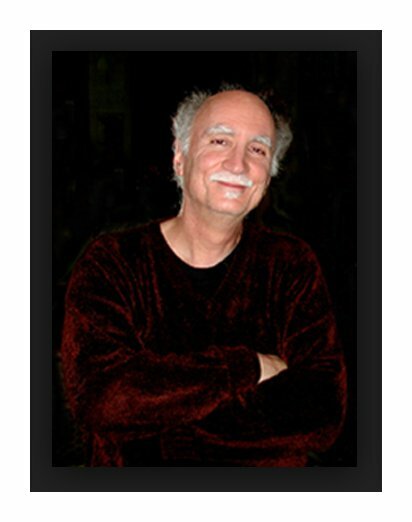 Frank Proto Interview with Bruce Duffie . . . . . . . .
My guest for this interview is Frank Proto. His last name is pronounced Proh-toh, which rhymes with photo... or, if you will, Mr. Moto, à la Peter Lorre in the series of detective movies made in the late 1930s! His world embraces many musical styles, a more varied palette than most who do similar kinds of work. A detailed biography from the website of his publisher is at the bottom of this webpage. 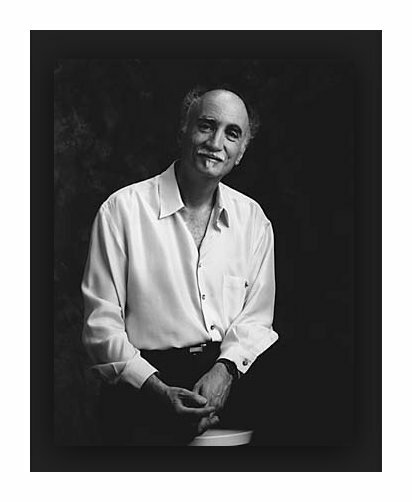 He is a composer and bass player, and was in Chicago for the convention of the American Symphony Orchestra League in June of 1988. We met at his hotel and had a brief but interesting conversation. Here is what was said on that busy afternoon . . . . . . . . .
Bruce Duffie: You handle both pop and classical? BD: Are you making your money on the pop? FP: Pops and young people’s music. FP: Actually I do make a little money off of the classical. Some of my chamber music is played a lot. The String Quartet is played quite a bit. That was recorded around ten years ago, but the Kronos has been doing it on tour this year, and they’ve played it on and off. As far as making money on it, it’s not really a money making proposition; it’s more prestige. You get a few royalties. Maybe the publisher will sell a few copies of it, but we keep saying “making money.” It pays off in indirect ways, sometimes, any of these non-pop things. For instance, a couple of years ago I did a piece for the Cincinnati Symphony called Dialogue for Synclavier and Orchestra. The synclavier, if you are familiar with it, is a high-end digital synthesizer sampling machine, but it does many other things. It prints music. It has a very sophisticated music printing program which I use for all of my music now. You can take a look at some of these scores, and you can see the ones that are hand copied in the traditional way, and the ones that look engraved. It helps me a great deal in getting performances, because my music at this point doesn’t present any of the technical problems for the players. I’m talking about problems where you send the a new piece to an orchestra, and they spend three hours looking for wrong notes, trying to find wrong notes, or trying to find the missing measures, that type of thing. It’s very unromantic stuff, but it eats up a hell of a lot of rehearsal time. BD: Do you think differently when you are writing a piece for a Pops concert, as opposed to when you are writing what is called a serious piece, or a concert work? FP: In the Pops area, usually it’s a commission, and it can be a wide-ranging. I work in such a wide area, even the Pops, that I have to know who I am working for. For instance, Doc Severinsen says to me, “Frank, I need a piece, oh, twelve minutes long, between twelve and fifteen, or between eight and ten.” He’ll give me a time; he’ll tell me which tunes. He’ll say to me, “I’m going to be doing this with certain A orchestras, B orchestras, C orchestras. I’m going to have one rehearsal for this piece,” so I know I can’t present any technical problems to the orchestra that are insurmountable. They have to be able to put this piece together with a read-through. BD: And yet it’s still got to be interesting enough for the players and the audience? FP: Right, it’s got to be something new, and it’s got to sound like a high class arrangement. It can’t sound like he’s doing an arrangement that was written for a high school band with strings added. BD: On the other hand, then, your concert music is what? FP: For my concert music, usually the conductor or the soloists or whoever’s commissioning the piece will give me some of the same things. He’ll say, “I’ll be doing this with an orchestra that is able to negotiate from here to there.” In other words, maybe a C orchestra or a B orchestra. “So take it easy, you know. Don’t go haywire.” However, they do have a lot more rehearsal time. Usually they’ll get three rehearsals, which is a lot. It’s quite a bit. Then there’s the thing if it’s for a soloist. For instance, I wrote these two concertos for Franҫois Rabbath, the double bass virtuoso. One of them I could do anything I please. He just said, “Write me a piece. I want half an hour.” I wrote him a half an hour piece, and we played it in Cincinnati. It’s also been played in Copenhagen and a couple of other places. It’s a very difficult piece, but it’s fantastic! It is on one of the albums I brought you. BD: He said, “Write anything that you want.” Did you take it as a challenge to write one of the most difficult pieces you could? FP: No, no. I know Franҫois’s technique. To begin with, I’m a bass player so I can write for the instrument, but I know his technique, which is just unbelievable! So when I wrote the concerto, I could do whatever I pleased — within certain reason! I want to get my pieces played, so I don’t want to walk in and say, “You need three screech trumpets and six saxophones,” and that kind of thing. I write for normal orchestra, maybe with a couple of added attractions. Then on the other side of the album there is a piece called Fantasy for Double Bass and Orchestra. That was commissioned by the Houston Symphony, and the guidelines were more strict there. They said, “Francois is playing on this program. He’s already playing another piece, a Vivaldi violin concerto on the bass.” When he plays it, it’s fantastic! “We need something short, not more than twelve minutes or so.” So my piece is about fourteen, or something like that. It’s pretty close. Not too difficult, because there is very little rehearsal time. So I had those guidelines to work with. Musically, they don’t say, “I want it in this style or that style.” They more or less know my style, where it is. BD: That’s why they come to you, because they want your style? FP: Right. If you’ve heard any of my music, you know it’s rooted in jazz, and that’s me. It’s not conscious; it just happens. BD: Let me ask a philosophical question. In your music specifically, or in music in general, where’s the balance between artistic achievement and the entertainment value? FP: I don’t think it’s a sin to write a piece at the level you would like to write it. I don’t think it’s a sin that a piece entertains. For instance, in these two pieces I wrote what I wanted. No one said to me, “You can’t do this, and you can’t do that.” I wrote what I wanted to write. I wrote the music that came out of me, naturally. It’s not something I forced out. These two pieces are very natural pieces for me to write. Luckily, they are also pretty accessible to audiences. Whether that’s good or bad? I think it’s good, because the pieces get a chance to be played. Some people will listen and say, “Oh, it’s not serious music.” But it is; for me, it’s serious. BD: What for you is the purpose of music? FP: Another philosophical question, my God! What is the purpose of music for me? I’ve never thought of it exactly in those terms. It’s my life. It’s everything. I don’t know how to answer that. BD: Let me change it a little bit. What is the purpose of music in society? FP: I don’t think there’s one answer to that. I think to different people, music means different things. For some people, music to them is while they are doing something else. It’s lulling them, in one way. It might be lulling them to sleep. It might be keeping them company while they are doing something alone. For others, it’s very, very serious. They listen to every note of what they are listening to. I have a hard time speaking with someone when music is playing, even if it’s in the background, because I start listening to it and I’m distracted. BD: Is this a problem that we are having now with audiences, that they no longer listen? BD: Did you go back and put in what was missing? FP: I didn’t do it, but in the next piece, which was the bass concerto that I wrote for Rabbath, I didn’t let that happen. I said, “This piece is going to end when it has to end.” It went a little long, and Rudolf wrote back to me and said, “Finally you got the form right!” He’s very concerned about the form, the formal development. He kind of puts a leash on me sometimes. He’ll really let me have it if I’ve gone one way or the other. The reason I brought this up is because I had a review in a magazine lately, and it was curious. It was a review of the Quintet for Strings and Piano, and the reviewer said wonderful things. He liked everything, and at the end he said, “But it’s too long.” He didn’t say why it’s too long or what was too long, in his opinion. It’s a long piece; it’s a half an hour. It’s a heavy duty piece, and it requires serious attention. My serious pieces do, and even my Pops things I feel this way, but it’s not the same with Pops. For the serious things, I am asking the listener to put down your housework, and put down the paper and the books, close your eyes, and concentrate. That’s what I’m asking as a composer. With the Pops things, I’m not asking it to the same degree. I’m meeting them on more familiar territory in the Pops music. I know I have to do this. BD: When you are writing a piece, are you always in control of the pencil, or are there times when the pencil is controlling you? FP: That’s difficult. Sometimes, like when a virtuoso plays, his technique takes over. This is also true of some of the really great jazz players with their technique. Sometimes they are playing, and their technique takes over, and the musicality is secondary to all the notes they are playing. That can happen; I know it’s happened to me, when for some reason I might be under the gun; the deadline might be there. I go on automatic pilot and I start doing things that are familiar to me. Like the jazz player who plays badadadadada; he plays the same thing in forty million different tunes when he needs to fall back on something familiar. It’s dangerous. I try not to let that happen. BD: Sure. That’s the musician in you. FP: If I know they are going to be played again, for instance the cello concerto. If I knew I had an important performance coming up, I’d go back and fix what Max objected to. BD: But in general, are there urtexts and revisions and various versions of things? FP: For some of them there are. The bass concerto I revised after the first performance. The first performance was in Copenhagen, and it was too long! It just had too much in there. The thing was taped, and I listened to it over and over and over, and it was easy for me to revise; it was easy for me to fix up. In fact, I did it with a razor blade. I cut things. I said, “Oh, okay. I’ll fix this. I’ll put a little bridge between these two places.” If my Dialogue for Synclavier and Orchestra ever gets played again, the first movement needs revision. BD: So then you’re constantly learning? BD: Have you basically pleased with the performances of your concert music? FP: Yes! This is unusual. My Pops music gets an awful lot of performances, and an awful lot of them not so good, but the tapes and recordings I have heard of my original things, my serious pieces — terrible word, “serious” — generally have been really good. I have been happy with them, the bass concerto, particularly. David Stahl did a fabulous job, and Franҫois is just a monster. When you hear him, you’ll go nuts. You’ve never heard playing like this! He’s unto himself. He’s an original. There are some other bass virtuosos. Gary Karr’s a great player, but he’s different. They just happen to hold the same instrument in their hand; otherwise they are totally different. BD: Now would you have written a bass concerto if this guy hadn’t come to you and said, “Write something for me”? FP: Actually, that’s my second bass concerto. I now have four of them. One’s for violin and bass, one is for bass alone, and these other two. I’ve written a lot of bass music because I’m a bass player. I’ve written about thirty or forty pieces for the bass in various contexts. The quintet has a bass in it. I just wrote a piece last year called The Death of Desdemona. It’s based on the last act of Otello, and there’s a famous bass solo in there. It’s for bass and synclavier, and it’s a wild piece. It hasn’t been recorded yet, but I think it will be in the next year or so. Somebody’s going to do it. A lot of people are playing it. BD: How much leeway do you allow for interpretation in these pieces, and is there more in a concerto than there would be, say, in a string quartet? FP: In a concerto I try to leave as much as possible. Because I’m also a player, when I play a piece I want to be able to put myself into it. I don’t write the solo parts so strict that the soloists must play it the same way every time. I try not to put the soloists in a straightjacket. There’s room to expand and play a different performance each time. Sometimes it’s to the point where it’s improvised; other times it’s just maybe that the orchestra part is very simple and the soloist can float on it. BD: Is there ever a time that they pull it out of shape? FP: Many times. It’s very dangerous to do that because you get soloists, and conductors for that matter, who are not familiar with the style that you are writing in. It’s really a big problem. The jazz style is the hardest style for symphony players in the United States. It’s crazy. It’s our own music and it’s not part of our blood. BD: You work in the jazz area and the pop and the serious side. Are you what they call a crossover person, or is that a terrible word? FP: I don’t know. I guess I am. For a biographical sketch of me, they interviewed me and asked me, “What were your influences?” I said, “When I was a kid, on the record shelf in the house was Sinatra, Basie, Puccini, Beethoven, Bing Crosby, Stan Getz, Dizzy Gillespie, Schoenberg...” It was all there, and I when I went to school it was a very wide ranging interest. Everybody had a wide range. Let me put it another way. When I went to school there was such a diversity of interests. There was a lot of jazz, there was a lot of modern music, modern orchestral music, that type of thing, and for some reason, Schoenberg was in during my junior year of high school. Everybody was listening to him, and at the same time Dizzy Gillespie was at the height of his powers. We’d go to Birdland and hear him. BD: I asked if you were pleased with the performances. Have you been pleased with the recordings, because they have a more general distribution? FP: Yes, most of the recordings. The String Quartet is excellent. The Minneapolis guys are wonderful! I love it. Rabbath, ah, that’s my favorite recording, those two pieces. BD: Are there other recordings besides these that are out here? Perhaps old ones, and things like that? FP: Yes, there are some old ones, and some double bass things. I played them. They’re not as good as these, but... I recorded my Sonata for Bass and Piano, and I did both the piano and the bass part. That was before the days of very sophisticated multi-track recording. That was very simply multi-track. BD: You lay down the piano part, and then played it over your headset while you play the bass part to it? BD: Yes, and you couldn’t do much editing in those days with that kind of tape that we were using. I had to really play it as well as possible straight through without mistakes, so there’s a few spots in there that are not really right. BD: [With a gentle nudge] Is it really a sin to ask the performer to play something well straight through, rather than rely on the cut-and-piece? FP: Some performers. Among the other things I do, I’ve engineered and produced many albums. My heart is with the performers, because I’ve been in the hot seat myself many times. I’ve worked with some people who needed one or two takes, that’s it, go home. Others, every measure we must splice this, splice that. They’re never happy. It’s out of tune; it’s not together; it’s not beautiful. You run into the gamut. BD: What makes a piece of music beautiful? BD: Great! So you can die happy, then? FP: It’s something I look forward to a great deal. I get very excited when somebody asks me to write a new piece for them. I’m full of ideas, and when I’m finished I’m elated! I feel so good. I finished a piece just before we left for Chicago for this conference. But the in-between part, the working part, that’s where it depends. You’ll sit down and nothing will happen for hours and days. Then it’ll go like mad and you’re having a ball, and you can’t wait to get back to it. I don’t know if its fun. Sometimes it is; when it’s really going nicely, it’s fun. When it’s not so nice, I think I’ll never do it again. BD: But then you do? BD: Thank you for spending a little time with me. I appreciate it. FP: My pleasure. It’s wonderful here in Chicago. We don’t come here often enough. 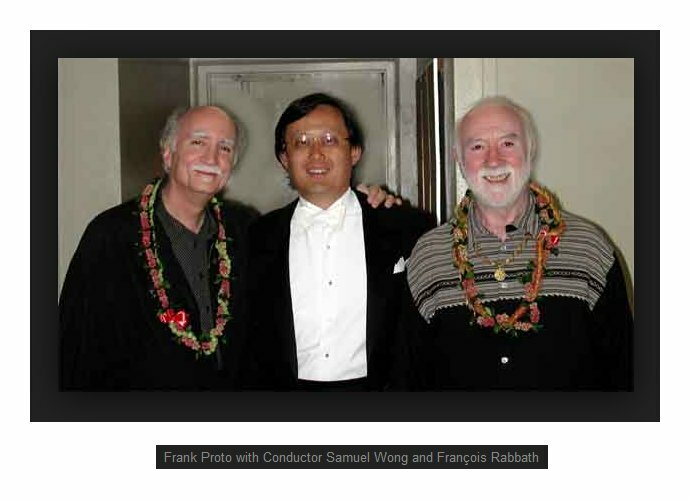 Frank Proto was born in Brooklyn, New York in 1941. He began piano studies at the age of 7 and the double bass at the age of 16 while a student at the High School of Performing Arts in New York City. After graduating he attended the Manhattan School of Music where he earned his bachelor's and master's degrees. 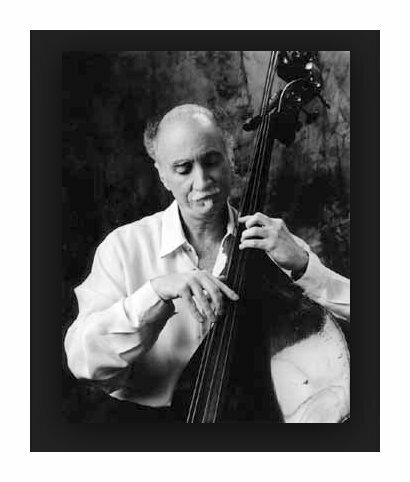 As a student of David Walter, Frank performed the first solo double bass recital in the history of the school. As a composer he his self-taught. For his graduation recital in 1963, Proto confronted the typical bass player’s problem - there was very little literature for the instrument. He programmed a baroque work, a romantic piece, and an avant-garde composition using electronic tape, but he wanted a contemporary composition in a more American style. Unable to find one he liked, he decided to write his own. 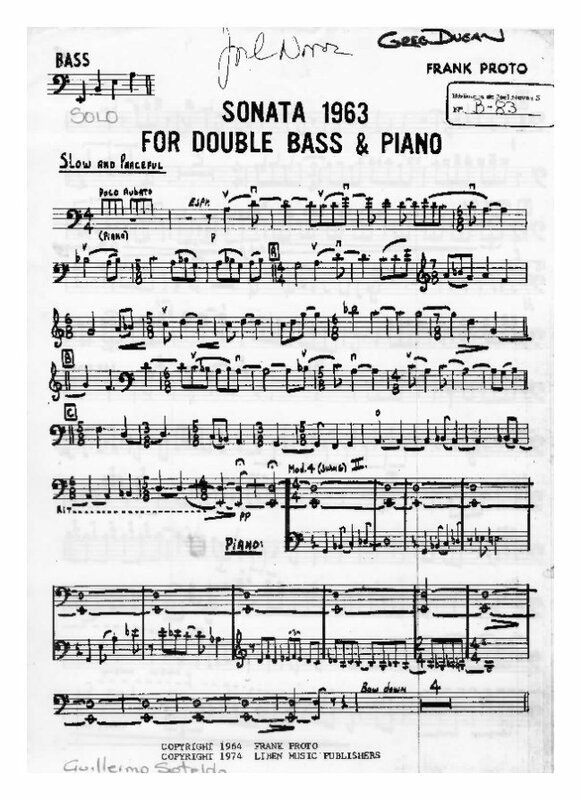 The resulting piece — Sonata 1963 for Double Bass and Piano — was his first composition. It has subsequently been performed hundreds of times worldwide by scores of bassists, and has entered the standard double bass repertoire. In 1977 he began a collaboration with the Syrian-French double bass virtuoso François Rabbath. He has written Rabbath four major compositions — with a fifth in the works — with orchestra that span a musical landscape from the most contemporary and serious - Four Scenes after Picasso - to the most unusual Carmen Fantasy that anyone is likely to encounter. Rabbath, whose musical appetite is as wide-ranging as Proto’s has recorded all of the pieces and continues to perform them worldwide. 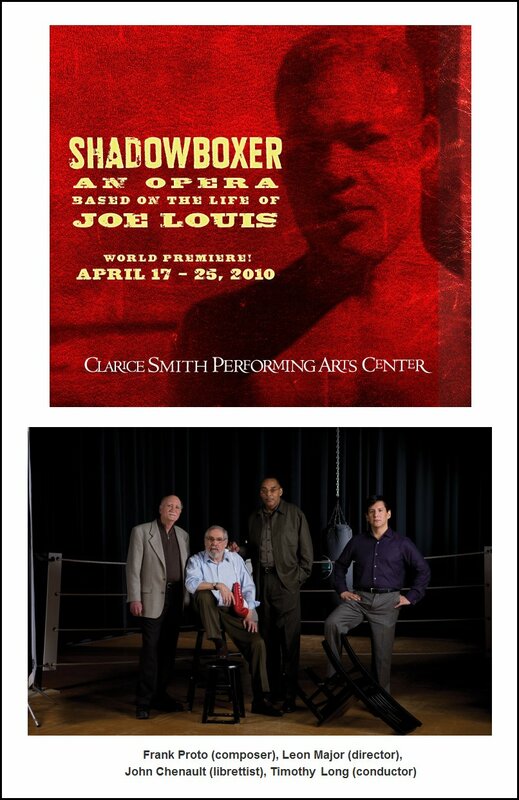 In 1993 Proto began another collaboration — with poet, playwright and author John Chenault. To date they have written eight works together, the most notable being Ghost in Machine - an American Music Drama for Vocalist, Narrator and Orchestra. Commissioned by the Cincinnati Symphony for the its 100th anniversary in 1995, the work brought Proto and Chenault together with the vocalist Cleo Laine and actor Paul Winfield for the first time. Ghost is a work that is not easily pigeon-holed. It is a large-scale orchestral work that uses elements from a wide spectrum of the musical landscape woven around an equally wide-ranging text that explores contemporary society’s problems with racism, religious intolerance and gender warfare. The success of Ghost resulted in two new commissions for the pair. The Kennedy Center for the Performing Arts in Washington D.C. commissioned a work for Cleo Laine to celebrate the new millennium. The result - The Fools of Time - is a jazz-based work and was premiered in February 2000. At the other end of the musical spectrum is My Name is Citizen Soldier, commissioned by the Louisiana Philharmonic Orchestra to celebrate the orchestra’s 10th anniversary and the opening of the National D-Day Museum in New Orleans. The work, a tribute to the veterans of World War II, was premiered in September 2000 with actor Paul Winfield as the soloist. Proto believes strongly in maintaining the connection between composing and performing — a tradition that once was the norm but is now the exception outside of the jazz and pop fields. He does not hesitate to pick up his bass to play with a jazz or chamber music group or travel near or far to play a solo recital. "It helps a great deal to experience what a soloist feels when under the lights," he says. Currently in a long-term project to record all of his chamber music for the Red Mark label — Eight CDs and Four DVDs have been released to date, with several more in various stages of production — he continues to maintain his double life as both a composer and performer. This conversation was recorded at his hotel in Chicago on June 15, 1988. Portions were broadcast on WNIB in 1991 and 1996. This transcription was made and posted on this website in 2014.